As timelapse photography continues to grow in popularity, Manfrotto has launched the PIXIPano360, a remote-controlled motorized head designed to take some of the work out of capturing both timelapses and panoramas. This small and lightweight device is designed for use with smartphones and action cameras, as well as with compact cameras and DSLRs. And as the name suggests, the PIXIPano360 provides a 360° head rotation, and has a maximum payload of 2kg, so it can safely accommodate a wide range of camera and lens configurations. To use the PIXIPano360 you simply attach it to a tripod using the quarter-inch thread attachment on the bottom of the device. To attach your phone you then use the included smartphone holder, and to attach a camera you can use the quarter-inch male thread attachment on the top of the device. 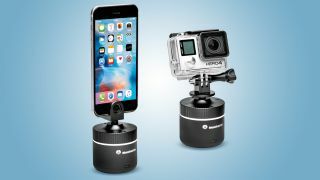 You can then use the companion smartphone app or an external remote to take control of settings for capturing timelapses, hyperlapses and panoramas. The PIXIPano360 app provides full control over the speed and angle of rotation, plus the photographic stitching algorithm makes it easy to produce panoramas. The PIXIPano360 is available now in the UK, priced at £124.95. Availability and pricing for the US and other regions is yet to be confirmed. Manfrotto has also announced the Pro Light Bumblebee camera bag family. The series comprises two backpacks and two messenger style bags, all designed for use by professional photographers and videographers working in harsh environments where comfort and durability are essential. Manfrotto Pro Light Bumblebee bags are made from rip-stop fabric and feature the Manfrotto Protection System to keep your gear safe – this is basically the removable dividers that can be customised to suit your needs. Both the backpacks and messenger bags feature an AirSupport harness system, which is designed to allow airflow and to reduce stress and on the shoulders, neck and lower back. The backpacks also offer a breathable back panel. Bumblebee backpacks are configurable to allow you to carry up to 70% photography kit and 30% accessories and personal gear, with rapid access points and a tripod harness for your three-legged friend. The larger Bumblebee-230 PL is for professional gripped DSLRs, modular camcorders and a number of lenses. The Bumblebee-130 PL is more suited to prosumer DSLRs, CSCs with additional lenses and all-in-one camcorders and accessories. The Bumblebee messenger bags provide a body-gripping fit alongside a three-point AirSupport harness system. This is alongside a new XtraSecure handheld gimbal carrying solution, silent Velcro and two bunge cord straps to hold a small tripod or monopod. Plus, the bags can hold a pro-size DSLR when a laptop isn’t carried. The larger of these two bags, the Bumblebee M-30 PL, can carry a DSLR with a lens attached with space for three additional lenses, a handheld gimbal and a 15-inch laptop plus accessories. The Bumblebee M-10 PL holds a CSC/DSLR with a lens attached with space for two additional lenses, a handheld gimbal and a 13-inch laptop plus accessories. It can alternatively carry a DJI Mavic setup and the Osmo gimbal camera. All Bumblebee bags come with a DuoFace sun/rain cover. Prices for the new Bumblebee collection starts at £109.95 for the Bumblebee M-10, with the top-of-the-range Pro Light camera backpack Bumblebee 230 costing £229.95. Availability and pricing for the US and other regions is yet to be confirmed.